The Supreme Court of the United States will hear oral arguments Dec. 4 in the case of Christie v. National Collegiate Athletic Association. The arguments are complicated and the Supreme Court’s ruling will not necessarily be black or white. But what it boils down to is whether or not sports betting can be allowed at New Jersey’s racetracks and casinos. If New Jersey wins, it is expected to create a domino effect with legal sports betting becoming widespread in this country within five to seven years. But will this benefit racing or hurt the sport by cannibalizing existing handle? Today, in the first of a three-part series, The Thoroughbred Daily News looks at the New Jersey case and what impact sports betting would have on Monmouth Park and others in the short term. Dennis Drazin, the head of the management team that runs Monmouth Park, doesn’t give up easily. The efforts to have legalized sports betting at the New Jersey racetrack and casinos started way back in 2009. New Jersey State Senator Ray Lesniak filed a lawsuit challenging The Professional and Amateur Sports Protection Act of 1992, claiming the law was unconstitutional. Some two years later, New Jersey voters backed a statewide referendum allowing for sports betting. In 2014, state lawmakers passed a law making sports betting legal within the state. Yet for every victory there was a setback, always in the courts. The four major sports leagues and the NCAA kept suing and winning, arguing that New Jersey could not have sports betting because it violated federal law, PASPA. PASPA outlawed sports betting outside of Nevada and three other states with limited forms of sports wagering. It did not interfere with the Interstate Racing Act of 1978, which essentially allowed simulcasting across state lines. Pro-sports betting forces, led by Drazin, but also including the casinos and allies in New Jersey State government, were faced with a situation that seemed virtually hopeless, but they pushed on. The Supreme Court was the last chance and the Supreme Court agrees to hear only about 100-150 of the more than 7,000 cases that it is asked to review each year. The situation looked even worse when the Solicitor General of the United States advised the Supreme Court not to take the case. Against those odds, the court has agreed to hear the case. The argument will take place Monday and it is expected that the court will announce its decision some time in the late spring. Drazin took a 1,000-1 shot and now his side is the favorite: most experts believe New Jersey will prevail. No matter what the odds may be, outlawing sports wagering in this country seems to be a law where no one wins. Sports betting is already widespread in the U.S. but, with the exception of Nevada, it’s done in the shadows, either through bookmakers or on off-shore betting websites. It is an industry that is unregulated and not taxed, with billions being made illegally, and it’s not going away. The American Gaming Association estimates $150 billion is bet annually on sports by Americans. 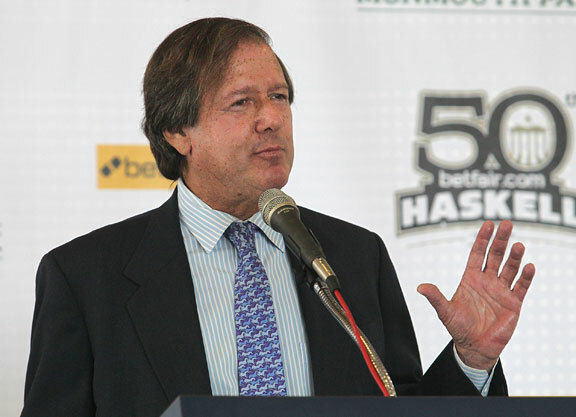 Drazin says the Supreme Court will likely render one of three decisions: that PASPA is the law of the land and New Jersey cannot have sports betting; that New Jersey’s partial repeal of PASPA is legal and New Jersey and New Jersey alone will be permitted to have sports betting; that PASPA is unconstitutional, which would likely open the floodgates for legalized sports betting to quickly spread across the country. Should the Supreme Court rule in favor of New Jersey’s partial repeal, that would give other states a chance to use legal maneuvers similar to what New Jersey did, but would no doubt delay a widespread rollout of sports betting as states would be left scrambling to figure out what avenues are available to them. Once the decision is announced, the racing industry will have to react quickly, trying to figure out what it means for the sport on a state and national level and how racing can protect itself from what could prove to be powerful competition for the gambling dollar. Monmouth Park’s situation is not comparable to that of any other racetrack in the country. The track is leased by the New Jersey Thoroughbred Horsemen’s Association, so the horsemen and racetrack management are essentially one and the same. Drazin has fought this fight not to fatten the pockets of a major corporation or a casino company, but to preserve Monmouth Park. It is an iconic racetrack that has fallen on hard times because it is the only Thoroughbred racetrack on the Eastern Seaboard that does not benefit from casino gaming revenue. Competing against tracks with larger purses has been difficult and Monmouth desperately needs new revenue streams to improve its purses, its product and its handle. At Monmouth, racing will benefit from sports betting. Should New Jersey win, Monmouth doesn’t plan to waste much time before opening up its sports book. It has already partnered with the William Hill bookmaking company and has already spent $1 million preparing part of the facility to serve as a sports book. Originally, Drazin said they would not open up the sports book until the beginning of the 2018 NFL season, but now says the plan would be to start up shortly after the decision is announced. As far as what sports betting would do for Monmouth, Drazin has already worked up estimates and they are based on only the bricks-and-mortar racetracks and casinos being allowed to have sports betting. (There is wording in the New Jersey laws that allows for “former” racetracks to also have sports betting, which would open the doors for Atlantic City Race Course to have a sports book and even for one to open within the mall that has replaced Garden State Park). Drazin believes $10 billion would be bet annually on sports in the state and that Monmouth would account for about 10% of that total, or $1 billion. The gross revenue he said would be $75 million, with $25 million coming out of that total for overhead. That leaves $50 million in revenue, which would be split evenly with William Hill. Whatever the numbers are, they would be enough to give New Jersey racing a major boost. Drazin has talked about going back to a regular fall meet at the Meadowlands, restoring bonus programs for New Jersey-breds, and, of course, higher purses across the board. Drazin said he was hoping the Supreme Court’s ruling would be for the partial repeal. That way, sports betting would be limited to the casinos and racetracks. A ruling that declares PASPA unconstitutional allows for too many unknowns, like internet wagering and for betting shops to pop up on virtually every street corner, as is the case in the U.K.
To get the sports bettor to pay more attention to horse racing, Drazin is considering pick three-like wagers that might combine two horses races and a football game or two baseball games and one horse race. The first legal single game sports bets made in this country outside of Nevada could be purchased at Monmouth Park some time in May or June 2018. That would be a very positive development for a track that badly needs revenue. But what would sports betting mean for the rest of the sport? 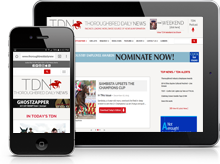 In part two of our series, the TDN will look at that question.